After being accused of not being a Nigerian and thus unfit to contest for to be President, Atiku has replied. Former Vice President, Atiku Abubakar who contested in the 2019 presidential election under the umbrella of the People Democratic Party (PDP), has described the petition filed by the All Progressives Congress contesting his citizenship as “idiotic”. Atiku revealed this through his media aide, Paul Ibe, who told Saturday Sun, that it was an insult to Nigerians and the office of Vice President which he occupied for eight years, for the APC to question his nationality. “That is idiotic. It is idiotic. And it is ridiculous. Atiku Abubakar is a former Vice President of Nigeria. “Are they telling us that a former Vice President of the Federal Republic of Nigeria is not a Nigerian? That is disrespectful to Nigerians and for the office he has held, which other people will hold and will continue to hold. “Everything must not be on the altar of politics,” Ibe said. Recall that APC has filed a motion at the Presidential Election Petition Tribunal in Abuja, stating Atiku is not a Nigerian. 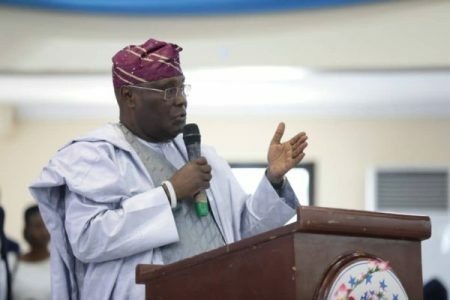 The party in its petition filed by its lead counsel, Lateef Fagbemi, faulted the candidacy of Atiku in the election, adding that he is a Cameroonian.